Discover recipes that fit exactly to your goal. You pick, the number of meals and how much time you can put into the preparation. You are the focus here! The plan that adapts to you. The plan that leads you to your goal. You have a goal? Very good! 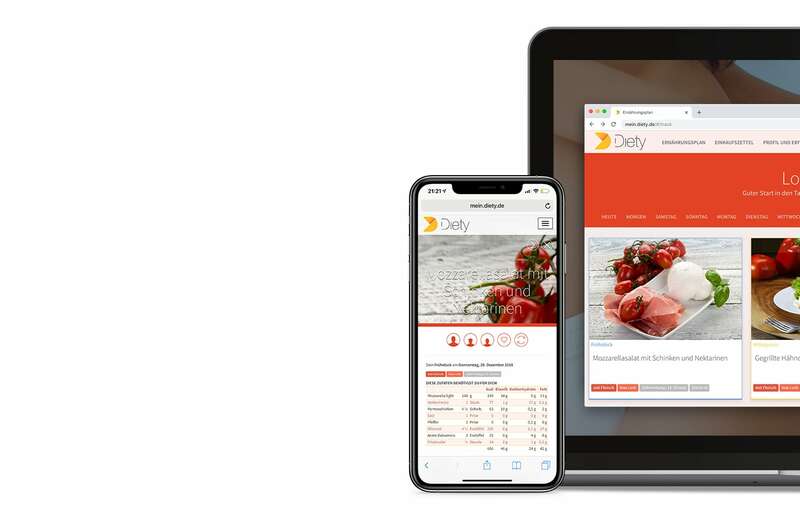 With Diety you have a partner at your side who supports you with your personal nutrition plan, all your preferences and thousands of suitable meals. From more than 25,000 recipes, you and we make the right choice. You say what you like, Diety tells you what suits you and your goal. On top of that, we adapt every recipe to your calorie requirements. That way you‘ll reach your goal faster. Without detours. Maybe you have different allergies or intolerances. Especially when there are several, it is often difficult to find tasty recipes. Diety can do that easily. Your personal nutrition plan takes all your intolerances into account and presents you only with recipes that suit you. Clever meal preap. Combine and save cash. Today steak, tomorrow salmon fillet - that‘s a lot of money. Combine tasty basic recipes and save money and time. Always with the right nutritional values and calories, your goal firmly in view. You do not like that? Then we have more than 1,000 alternatives for each meal. In the beginning, Diety may suggest meals whose ingredients don‘t match your enjoyment. You can change any recipe. Each recipe is automatically adjusted to your diet, calories and nutritional values. That‘s how it works with your enjoyment and your personal goal achievement. With your individual nutrition plan. Your nutritional plan - individual like you. Optimal nutrients without any remedies. Viele greifen während einer Diät zu Nahrungsergänzungsmittel. Warum eigentlich? Sicher weil sie nicht daran glauben mit natürlichen Lebensmitteln ihr Ziel zu erreichen. Diety zeigt es dir, dass es auch mit natürlichen Lebensmitteln geht — schwarz auf weiß. Da wir zu allen Lebensmitteln alle Mikro- und Makronährstoffe haben, ist Diety in der Lage dir deinen perfekten Ernährungsplan mit echten Lebensmitteln bereitzustellen. Immer passend für dich und deine Vorlieben. Always the right shopping list. No matter when and how often you shop. The Diety shopping list really saves effort in the week. Choose for which days of the week you want to shop. With one click you have the right shopping list at your disposal. With one click everything is on the shopping list. Sorted according to the aisles in a supermarket. Everyday life is stressful enough. From breakfast to dinner - always suitable for everyday use, set the maximum cooking time to 10 minutes or use the "do not cook" function. This saves you time without sacrificing nutrients. So you‘ll get to your destination more relaxed. For each of the 25,000 recipes, we have 7.63 billion adjustments. One for every person on Earth and exactly the right one. Every person is different so one person needs two Steaks and the other two Potatoes less - for the same dish. We call this recipe scaling. That‘s magic? Yes, we know! I don‘t like meat! I don‘t like eggs. But Low Carb. No problem! Admittedly no animal protein, LowCarb will be difficult to implement. Hey, but Diety can. Even vegan ketogenic diet is feasible with Diety. Everything is individually adjustable. As individual as you. Paleo, vegan, vegetarian, detox, low carb, food combining diet ... all in it. There are many ways of eating. The best you can find at Diety. You can also combine them. Vegan food combining? Here you go. Vegetarian Low Carb? Logical. You are convinced of a nutritional form or would like to try this one, then just test it. Lose weight, muscle building, body definition, fat loss, purification. Everything in it, just not all at once. It should be known by now that muscle building and weight loss cannot work at the same time. But one after the other. It‘s great when everything is as easy as adjusting Diety‘s goals and creating a new diet plan with just a few clicks. Dirt cheap - and mega valuable! Nutrition plans from the nutritionist quickly cost more than 200, 300 US$. This plan then hangs on your fridge until it falls off. Rigid without regard to season or everyday life. Diety costs almost nothing and offers you maximum flexibility to suit your lifestyle, the latest achievements in nutritional science and many thousands of recipes always adapted to your needs. Diety keeps you on track to reach your goal. Quickly down with the kilos, usually means quickly up again. Short-term projects such as 20 lbs in 4 weeks are never successful and sustainable. The pounds are quickly on it again and now hold on even tighter to your hips. It would be better for you to lose a little less weight per week, but to lose real body fat instead of just water and all that even more sustainably. With the Diety diet plan you can lose weight easily - with variety and without starvation. Yeah, I‘d have to do something about that. It‘s a lot easier to talk about than to go through with it. Diety will help you get it started and keep it going. The only thing it needs now is your drive to start. We have researched all the important studies of nutritional science of the last decades and have incorporated them into Diety without making it complicated for you. Nutrition is complicated. With Diety, it‘s easy to benefit from the achievements of scientists. We‘ll make sure you get enough to eat. A well-balanced ratio of the right calorie intake and getting enough to eat is a small secret of successful diets. The blood sugar and the glycemic index play a decisive role. With our Diety nutrition plans we make sure that your blood sugar is kept in check and that you are satisfied until the next meal. We only take the best. We sort out more than 4,000 foods that are best for you. And on these ingredients, the best recipes. Healthy, tasty, effective. One week: 2 lbs body fat, no water, body fat! 4 pieces of butter. Away! Even experienced personal trainers, who should know how a diet works, have loss 8 lbs in 1 month with Diety and with Diety you lose body fat and not water. Most diets work with tricks to display a more pleasant number on the scales within a few days - the trick is drainage. Water is important for your body. You don‘t need excess body fat. Diety will help you reduce that. We do both. For you. Everybody is invited to try out the latest trends and make his own rhyme on it. For some, it is almost a religion to feed low carb or ketogen. You can also set trends with Diety and combine certain diets. Macronutrients and micronutrients are equally present in farmed foods. We calculate for you your optimal nutritional needs and then select the best foods in the form of recipes. Nobody else can do that. Diet is Greek and means healthy lifestyle. And that‘s exactly what Diety does. It has become common practice to misuse the word diet for losing weight. The crash diet should not exist at all because diet means nothing further than healthy way of life. We do exactly that with you on Diety.de. I want to shine in summer. But not with belly fat but with my shape! Then you need enough sleep, exercise and the right food. Nutrition accounts for 70% of success. Positive as well as negative. Some even speak of 80 percent. Diety provides you with your successful nutrition plan for your personal goal. Diety, make it easy for you. The good thing about Diety is you don‘t have to worry about prohibitions and stuff anymore. Everything is automatic. No distraction - full concentration on your goal. With Diety quite simple. Losing weight isn‘t so hard. The important thing is that you consume more calories than you eat. Diety will help you and at the same time make you full and give you a variety of selected foods.